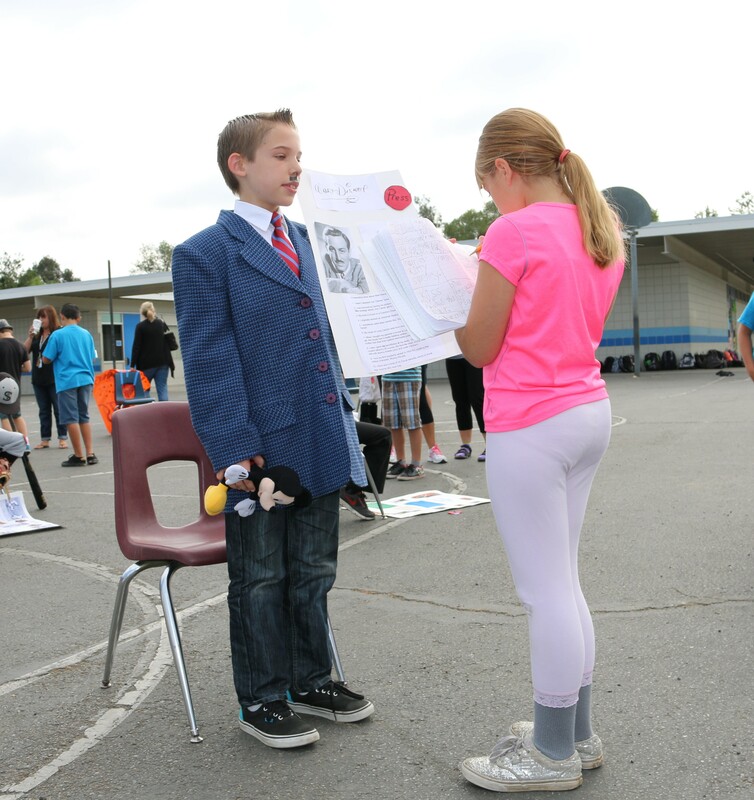 Fourth Grader Sadie DuBois meets Walt Disney (played by Noah Iverson). It started with an idea to “capture” an electrical charge. Benjamin Franklin, and his son, William, waited for a rainy day and after tying a key to the end of a kite string, found out what a shocking event really means. 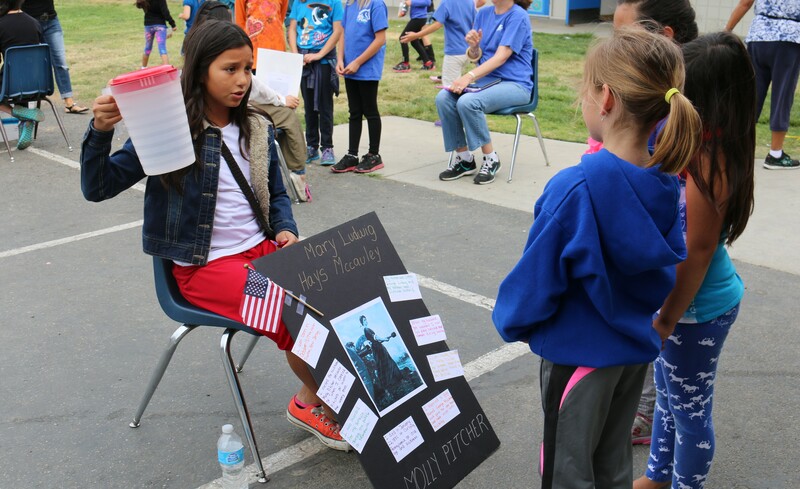 Franklin shared his story with schoolmates from Madera Elementary School last Thursday, as part of the school’s second annual Wax Museum event. Played by fifth-grader Zachary, Franklin sat in the play yard, armed with a posterboard outlining his life story and a “press” button. Passing students would press the button, Franklin would stand and history would be shared. 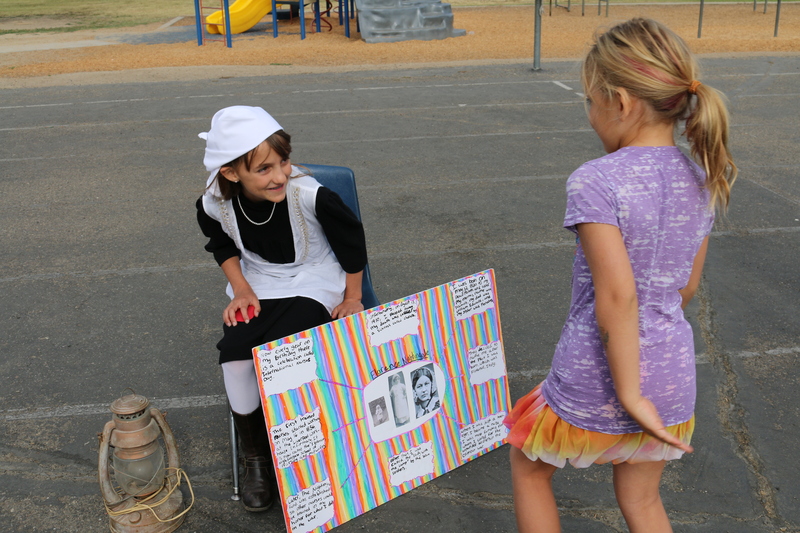 Florence Nightingale (AKA Paige Millet) shares her life story with a young listener. 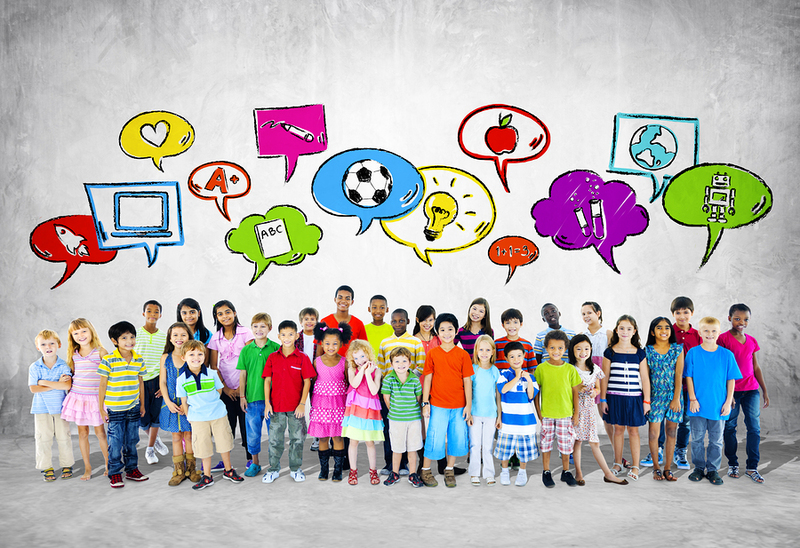 Altogether, more than 90 fifth-grade students participated in the event. Teachers Michelle Nicolas, Susan Cadwell and Rosalie Cruzan spent the last couple of weeks helping their students select a person who was important in American History. Student were offered some choices, but we free to select their own subjects. From there, they researched and wrote about their subject and developed the costumes and props used for the event. Most of the work was done at home, Nicolas said. “They did a great job!” she said. “I got my nickname because of how I carried the pitchers of water to the men,” Molly PItcher (played by Pamela Herrera) said. She shared her life with First Graders Summer Rainey, Liyah Reguerra and Samantha Enriquez (left to right). Ava Romerosa plays Molly Brown. The students created their own costumes at home. 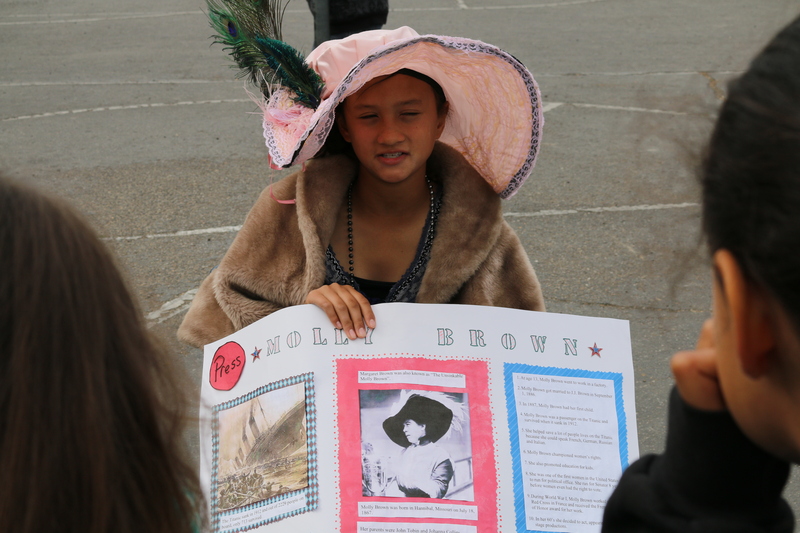 Throughout the morning, students from other grades visited the wax museum and learned about as many historical characters as possible. Rebecca Rojas’ fourth-graders came armed with notebooks and pencils. They will share the notes on the people they met when they go back class later in the day. “I wanted them to meet as many people as possible,” she said. Some of the figures included Betsey Ross, Dwight D. Eisenhower, Molly Pitcher, John Lennon, Robert E. Lee, Ronald Reagan, Molly Brown, Walt Disney, Florence Nightingale and Pocahontas. Principal Michael Hall looked proudly around the play yard at the kids. “Of all the things we do, this is my favorite,” he said.